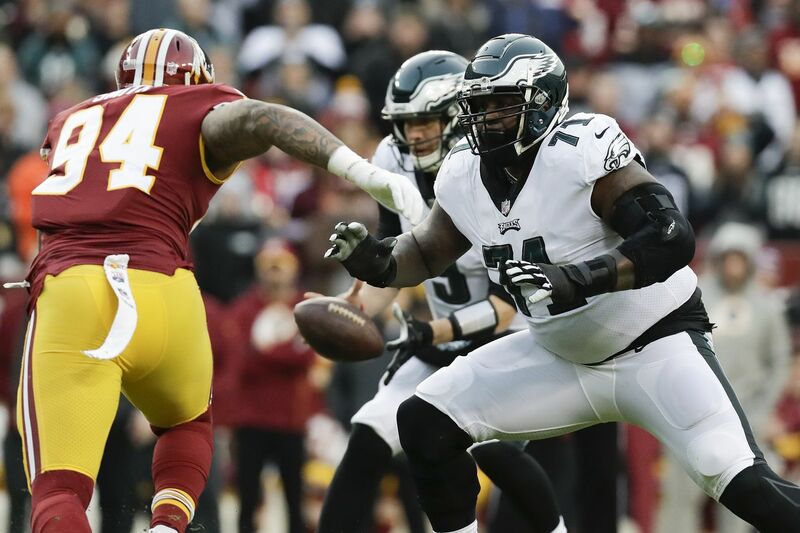 Eagles offensive tackle Jason Peters (71) watching Washington linebacker Preston Smith on Sunday. Breaking down the Eagles' playoff game at 4:40 p.m. Sunday in Chicago (NBC10), including key matchups and keys to the game. The Eagles employ a running-back-by-committee approach, rotating Darren Sproles, Josh Adams, and Wendell Smallwood. They rushed for 129 yards on 34 carries against the Redskins on Sunday and have averaged 5.0 yards per carry in the last five games. But the ground yards won’t come as easily against the Bears as they did against Washington. The Bears are first in the NFL in run defense (80.0 yards per game) and fourth in opponent rush average (3.8). They’ve neutralized many of the league’s top rushers, including the Rams’ Todd Gurley (11-28), the Bills’ LeSean McCoy (10-10), and the Cardinals’ David Johnson (12-31), but they did give up 125 yards (on 24 carries) to Giants rookie-of-the-year candidate Saquon Barkley in a Week 13 overtime loss. The Bears have allowed just 28 runs of 10 yards or more, the fewest in the league. Adams, an undrafted rookie, has been a pleasant surprise for the Eagles. The 6-foot-3, 225-pounder is averaging 4.3 yards per carry. Bears linebacker Khalil Mack (52) pursuing 49ers running back Jeff Wilson Jr. during the teams' game Dec. 23. In the Eagles’ wins over the Rams, Texans, and Redskins the last three weeks, Nick Foles had a 77.0 completion percentage and an 8.5-yards-per-attempt average and threw six touchdown passes and two interceptions. He’s been getting the ball out quickly — an average of 2.20 seconds from snap to release. He tied an NFL record Sunday with 25 straight completions, most of them short throws. Just six of his 33 attempts traveled more than 5 yards beyond the line of scrimmage. Alshon Jeffery has been a much bigger part of the offense since Foles replaced injured Carson Wentz. In the last three games, Jeffery has 16 catches, 11 for first downs, and is averaging 18.8 yards per catch. The Bears are as tough against the pass as they are against the run. They have a league-best 72.9 opponent passer rating. Their 27 interceptions are the most in the league. Their pass rush, led by Khalil Mack and Akiem Hicks, is third in sacks with 50. The Bears are just 27th in rush average (4.1). Jordan Howard is a powerfully built downhill runner who came up short on his bid for a third straight 1,000-yard season, finishing with 935 yards and nine TDs. Tarik Cohen is a Darren Sproles clone who averaged 4.5 yards per carry on 99 carries. The Bears run a lot of RPOs and zone-reads with quarterback Mitchell Trubisky. Trubisky has 31 rushing first downs, fourth most in the league among quarterbacks. Bears running back Tarik Cohen is very similar to the Eagles' Darren Sproles. The Bears aren’t a great first-down running team. They’re averaging just 3.91 yards per carry on first down, third worst in the league. That’s notable because the Eagles have had problems stopping teams on first down this season, though they held their last two opponents, Washington and Houston, to 1.8 yards per carry on first down. Howard has just two 100-yard rushing games this season. But both came in the last four weeks, including 109 yards on 21 carries Sunday against the Vikings. He is averaging 4.5 yards per carry over the last five games. Second-year quarterback Mitchell Trubisky brings many of the same things to the table as the Eagles’ Carson Wentz. He is a mobile quarterback with a strong arm who can extend plays and move the chains with his feet. He completed 18 of 26 passes Sunday against the Vikings but averaged only 6.3 yards per attempt. He hasn’t thrown an interception the last three games. Trubisky will spread the ball around. The Bears have five receivers with 400-plus receiving yards this season, including former Eagles tight end Trey Burton, who had 54 catches and six TDs. Cohen leads the Bears in receiving with 71 catches. They line him up all over the formation, and he will be a tough matchup for Eagles linebackers and defensive backs. The Eagles’ front four is playing as well as it has all season. The Eagles had 26 or more quarterback pressures in three of the last four games. The Eagles gave up just six TD passes in the last six games since being torched by Drew Brees in Week 12. The defense had just four interceptions in the first 10 games but has six in the last six. Jake Elliott has made 26 of 31 field goal attempts this season, including 16 of his last 17. His lone miss was a 53-yarder against the Rams. Elliott is seventh in touchback percentage on kickoffs (70.4). Eight of his last 11 have been returned, but only for a 22.1-yard average. The Bears are last in the league in average drive start on kickoffs (23.4). Punter Cam Johnston is fourth in net average (42.7), and the Eagles are sixth in punt coverage (6.3). They’ll be tested Sunday by Tarik Cohen, who is averaging 12.5 yards per return. Eagles punt returner Darren Sproles is averaging only 8.3 yards per return, his lowest average as an Eagle. His longest return has been 14 yards. Bears punter Pat O’Donnell has had just 32.2 percent of his punts returned. That’s the fifth-best percentage in the league. Former Eagles kicker Cody Parkey has been erratic. He has five misses from 41 yards or less, and has missed two of his last four field goal attempts, from 37 and 38 yards. He also has missed three PATs, including one Sunday against the Vikings. Ex-Eagles kicker Cody Parkey (1) has been inconsistent for the Bears this season. The Bears have lost just once at home this season. That was to the Patriots in Week 7 (38-31). They’ve scored fewer than 24 points at home just once. The Eagles were 3-4 on the road, not including their neutral-site win over Jacksonville in London. They’ve scored more than 24 points on the road just twice. Eagles OTs Jason Peters and Lane Johnson vs. Bears LB Khalil Mack: Mack, one of the league’s elite pass-rushers, will line up on both the left and right sides. Johnson was very effective against him last year, when Mack was with the Raiders. Peters’ health is a concern. If he has to leave the game, Mack will eat alive his replacement, Halapolulivaati Vaitai. Eagles DT Fletcher Cox vs. Bears Gs Kyle Long and James Daniels and C Cody Whitehair: Cox (career-high 10 ½ sacks) is a seismic force in the middle. He has 40 quarterback pressures in the last six games and will require constant double-teams, which will create one-on-one matchups for his linemates, who need to take advantage of them. Eagles WR Alshon Jeffery vs. Bears CB Kyle Fuller and S Eddie Jackson: Jeffery is averaging 18.8 yards per catch since Nick Foles replaced Carson Wentz. He has strong hands and a huge reach that give him an advantage on 50-50 balls. Fuller and Jackson are ball hawks who have combined for 13 interceptions. Bears quarterback Mitchell Trubisky hasn't exactly flourished on third down this season. Third-and-long: Jim Schwartz’s defense has rediscovered its third-down mojo. They Eagles have held their last three opponents to seven third-down conversions on 31 attempts. The Bears are 11th in third-down offense (41.0 percent). But Mitchell Trubisky is 17th in third-down passing and 23rd on third-and-long (8 yards or more). Just nine of his 39 passes on third-and-8 or more have produced first downs. Ball security: The Eagles have the worst turnover differential of any team in the playoffs (minus-6). The Bears, who finished third in turnover differential (plus-12), led the league in takeaways (36) and interceptions (27). Playing on the road against one of the league’s best defenses, the Eagles can’t afford to give the Bears easy scoring opportunities. Starting fast: The Eagles need to do something Sunday they haven’t been able to do most of the season: get off to a fast start. They finished last in the regular season in first-quarter scoring (41 points), but 20 of those 41 points came in their last five games. The problem is the Bears finished second in first-quarter scoring defense (38 points allowed) and seventh in first-quarter scoring offense (85 points).